There is so much to see in Death Valley National Park that it is a wonder anyone would need a day trip out to see anything else. Yet, there are some sites that are worthy of distraction from the largest national park in the continental United States. Many heads would naturally turn to the east, directing their eyes to the bright lights of Las Vegas, but mine turned back to the west and into the interior of California. 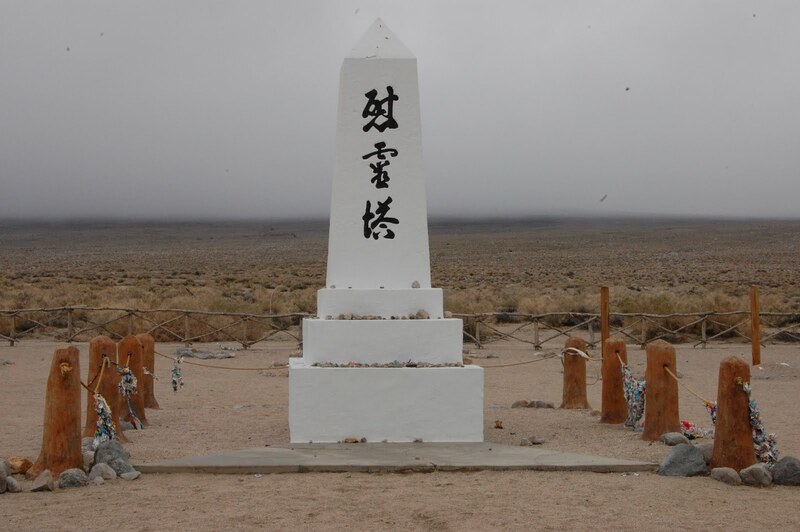 Just a short drive to the west from Death Valley National Park, over the Inyo Mountains and north of Lone Pine, California, is Manzanar National Historic Site. The name means “apple orchard,” which is slightly ironic, since the World War II Japanese relocation camp was situated in a harsh, dusty valley on the east side of the Sierra Mountains. After visiting a similar site in Colorado while writing my book, I was curious to see this one, too. Unlike the sad disposition of Camp Amache near Granada, Colorado, Manzanar looked to be taken care of; building replicas were constructed, the grounds were clear of debris, and a nice museum and visitor center explained the plight of 110,000 Japanese evacuees, largely from the western United States, during World War II. Despite the cold and rainy weather, I enjoyed touring the historic site for those reasons. And it was a good reminder about just how disrespected the Camp Amache site really is in Colorado, too. While also being educational, it was depressing to see the remaining foundations for barrack buildings that once stood to house the Japanese internees. I can only imagine the difficulties they endured, being ripped from their homes amidst racial prejudices many of us will never know It was all because of fear; during the time an internal attack on the United States by the Issei (first) and Nisei (second) Japanese generations was thought possible after the attack on Pearl Harbor in Hawaii. It is a bitter seed planted firmly in my nation’s history, and one that I could rant about for a long time. I did so briefly in my book, so I’ll leave it at that and hope that we can all learn from our mistakes. After all, their sacrifice, since that is what it was as the Japanese left peacefully – albeit begrudgingly – from their homes, would not be honored any other way than if we learned from what happened. It was most disappointing to see the small graveyard (very top) at Manzanar and to think about those who died on its grounds never again knowing freedom. The last thing they ever saw was the inside of an incredibly cramped barrack room, partitioned down so small that families practically fell over each other, or the freedom bey ond through the fenced compound guarded by towers. Either way, it was a sad and horrible situation that should be remembered with the dignity that the people who had to suffer it deserve. I drove past the entrance guardhouse and rebuilt towers as I left for Death Valley National Park. In the gloom of the day I felt a positivity that maybe as a community we’re learning lessons from our historical mistakes. 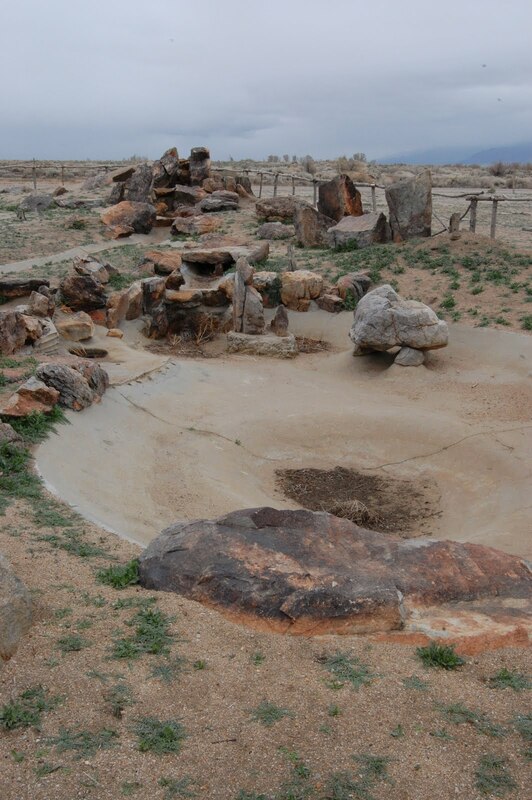 Protecting and restoring historic sites like Manzanar is a good first step in building on past lessons. And as I turned back onto the highway, it filled me with a resounding sense of hope that lessons can be learned from an old fountain garden.